Ms. Angela Joo-Hyun Kang, Founder and Executive President of Global Competitiveness Empowerment Forum participated in and contributed for B20 (Business 20) policy recommendations to G20 in 2016 during Chinese Presidency as one of B20 Infrastructure Task Force Members. There were 8 Task Force members from Republic of Korea from Federation of Korean Industries (FKI), Samsung, Hanwha, POSCO, SK, and Crebiz Factory including her, out of 553 Task Force members. She attended kick-off meeting on January 26 at Great Hall of the People in Beijing, China, the first joint Task Force meeting on April 17 at IMF headquarter in Washington DC. US, the second joint Task Force meeting on May 31 at OECD headquarter in Paris, France, Anti-Corruption Forum on April 27 at Grand Hyatt Hotel in Beijing, China, and B20 Summit on September 3-4 at Hangzhou International Convention Center in Hangzhou, China. Apart from offline meetings, she also participated in three conference calls among B20 Infrastructure Task Force Members. 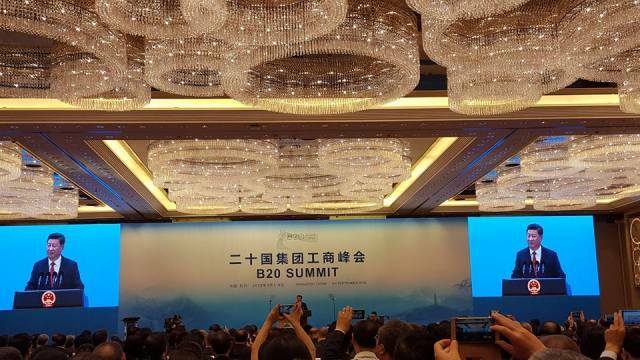 Chinese President Xi Jinping attended the opening ceremony of B20 Summit and delivered his keynote speech, “A New Starting Point for China's Development, A New Blueprint for Global Growth”. Following the address, Xi received the B20 2016 Policy Recommendations to the G20 from Jiang Zengwei, the 2016 B20 Chair and Chairman of the China Council for the Promotion of International Trade (CCPIT). 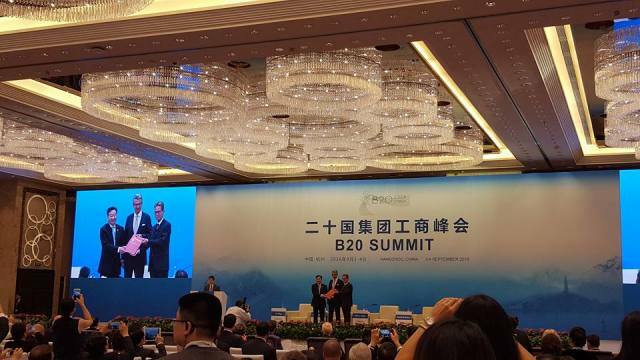 At the closing session of B20 Summit, Jiang Zengwei, B20 Chair, tranferred the B20 presidency to Ulrich Grillo, President of the Federation of German Industries (BDI), and Gerhard Braun, Vice President of the Confederation of German Employers' Associations. A group photo at the 2016 G20 Business Summit in Hangzhou, China. 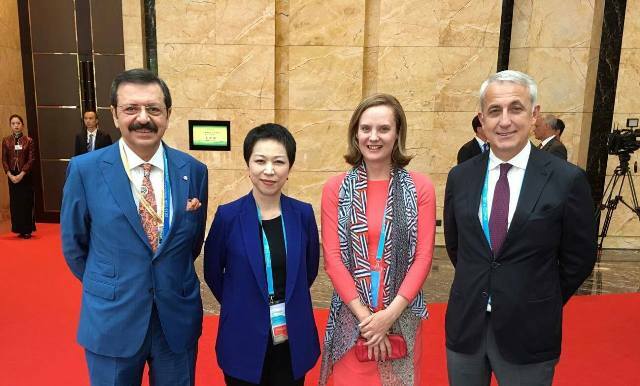 From the left, Mr. Rifat Hisarcıklıoğlu, President of the Union of Chambers and Commodity Exchanges of Turkey (TOBB) and B20 Turkey Chair, me, Ms. Clare Pearson, Chair of British Chamber of Commerce in China, and Mr. Jemal Inaishvili, President of the Confederation of Asia Pacific Chambers of Commerce and Industry (CACCI).